First off, let me introduce myself: I’m Vera, a 3rd year student at AUC and – as the other writers for this blog – I’m visiting the youngest country of the world: Kosovo. On Saturday the 13th, we had a full day of activities planned, so I have a lot to write about! When we had to meet at 9:30 at the Newborn sign in the center of Pristina, some of our group seemed slightly (read: hugely) hungover but nonetheless very excited for what was planned. We first met up with Elizabeth Gowing, the founder of ‘the Ideas Partnership’, an NGO that focuses particularly on cooperating with the Roma Ashkali Egyptian community in a part of Pristina called Fushë Kosova. In two vans (thus 12 people in one van) we drove to the community, which was only about 10 minutes away from the center of Pristina. Coming to this part of Kosovo was – at least for me – a real eye opener. It is crazy how the center of Pristina – rather modern with WiFi everywhere, electronic billboards, and people with the newest smartphones – lies so close to the Roma Ashkali Egyptian community, which really seemed like a post-war zone. Despite the poor conditions that these people live in, the children that we ran into seemed so incredibly happy and joyful, which is always a strange contradiction in my opinion. One of the things that seems to contribute to their happiness is The Ideas Partnership. This NGO provides the children of the community with (catch-up) classes and kindergarten in order to prepare them for ‘normal’ schooling. We talked a lot with Elizabeth and it was so nice to have a conversation with someone who worked more on a grassroots level and really made a difference in the everyday life of so many children. It truly was a contrast with organizations such as the UN. Don’t get me wrong, I would love to work for the UN or something similar in the future, but it also felt really good to see what one person could set up for a community such as the Roma Ashkali Egyptian one that we saw this day. After having spent some time down there, we walked back to our bus which brought us to a Serbian Orthodox church. This too was a very interesting reality, as it was completely different from everything we had seen so far. It was a small and dark church, and we were welcomed by one of the nuns who lived in the conclave and who worked to keep the church running. Moreover, the church was located in a part that was practically Serbian (rather than Albanian, as in the rest of Kosovo). The alphabet was different, we couldn’t pay with euros, and the people even spoke Serbian. This may not seem really strange, but for us it was really funny to see such a small community that was completely different from its surroundings. 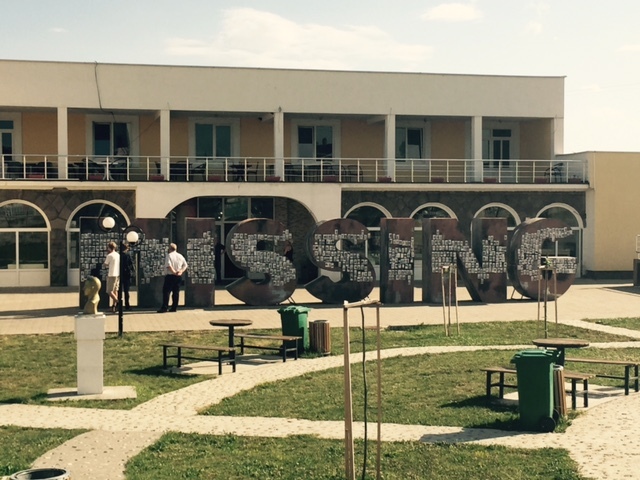 In the main square, there were even huge letters that spelled ‘missing’. Anne told us this was a response to the letters in Pristina that spell ‘newborn’, a monument dedicated to the independence of Kosovo. 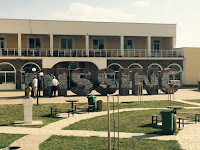 The ‘missing’ letters that we saw in the Serbian community, however, were sculpted exactly the same as the ones in Pristina, but referred to the Serbs that ‘disappeared’ after the independence. The letters were plastered with photos of the missing persons, which was quite shocking and took all of it to a bit of a more personal level. Once you see all the photos, names, and dates, all the numbers become faces and it all becomes a bit more real. So, compared to the days before Saturday, this day was rather confrontational for me. Instead of listening to someone while taking notes, we got to go into the field and experience what some citizens of Kosovo go through every day. Not only the Fushë Kosova community, but also the Serb community that still feels very marginalized where we were once more remembered that during conflict there is not only bad and good, or black and white. Peacekeeping? Keep walking, keep talking! Being home and feeling more frustrated then ever.